Threadsrflying in the Studio . But must admit this is not what one would think of as spring , currently the temperture is -12 . So we shall sew on . Easter in Talkeetna Alaska , snow is melting today . Our cold spell has traded itself in for temperatures in the 30's . The 4' of compressed snow in the front yard will be entertainment these next weeks to see if it evaporates like last spring or and I don't want to think of the other . So wish our little town all the best in our spring melt down . Snow ..... Spring in Talkeetna Alaska . The days are getting lighter and longer . Outside activities a little warmer in the upper 20's and 30's .Threadsrflying truly in the studio getting ready for may market . Here @ Threadsrflying studio it has been snowing about 3'+ , a path going from the cabin to studio is really fun . So quite @ night with an occasional dog bark in the distance . Or maybe @ the right time I can hear the sled dogs getting ready for their run . Alaska , is love when the weather is picture perfect . This was a baby quilt. commissioned by a client for their close friend in PA. 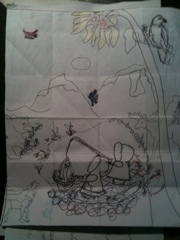 I first sketch out my idea, a sceen of Alaska for a child. 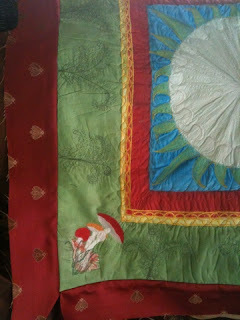 As you can see, in the sketch and finished quilt, how my vision came forth. This was made with so much fun, creativity, and just love. The top left quilt picture is all finished except for the plane , I wanted to get the K-2 plane colors . so they were added right before delivery. I love Sunflowers, and I know ,It may be hard ,to believe, but sunflowers grow great here, in Alaska. I scretched Muslin, on my Painting frame (made of 2"x2") . also used Dye washes. Embellished with threadpainting , stippling, hand embroidery. The animal characters present , wolf, moose, bear, raven, fish and eskimo children surrounded by fireweed, river rock, mountains, Moon, Sunflower, mountain climbers, airplanes. 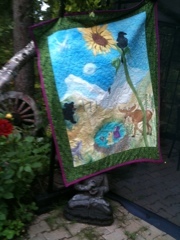 A border and backing of greenery Fabric, so represents summer Alaska, was purchased @ Talkeetna Gifts and Collectables. ( Love to go up stairs and wonder thur all the beautiful quilt fabric.) 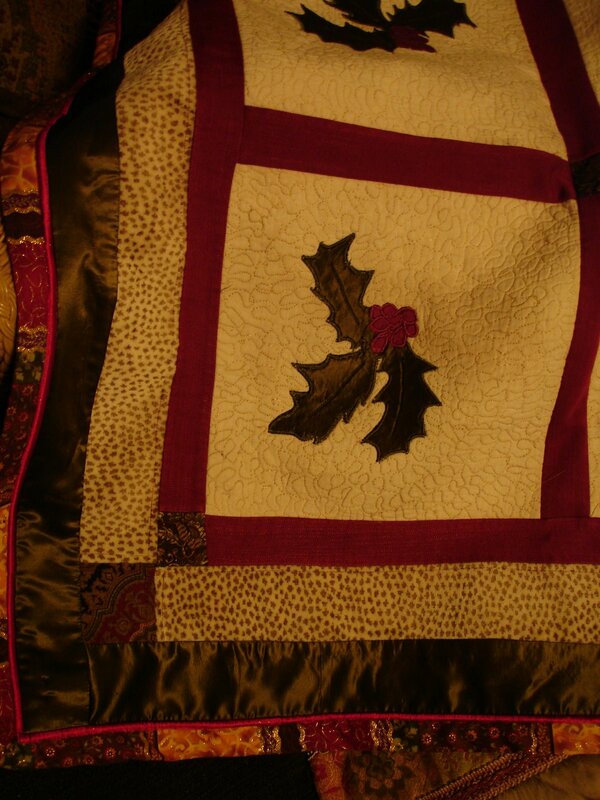 The fabric I picked out was so soft and set the whole quilt off, beautifully. The batting used inside was 100% , as was all the fabric. also I prewashed all the fabrics before and after . All the paints and dyes were heat set . 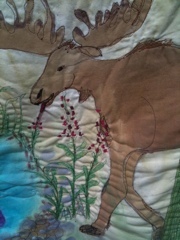 Was very pleased , so was client and the now owner of this so Alaskan baby quilt . This will be made again. Was made for Danny ,daughter, talked Daddy out of it, how could he refuse, his loving daughter. This was, so much fun, Okay, you have to the picture of how it was created. I'm @ the creative table (it is not my work Table, how can you call something ,you love to do, your work table or your work). I'm listeningto Danny, telling me the philsophical stuff of mushrooms and Listening to Todd on KTNA playing Jimmy Henricks . Wow ,Okay I'm overloaded. Well, I find myself scrunching up the muslin, to see if it would look like, the underneath of the mushroom. Next, doing all kinds, of crazy on it, to get it to stay . 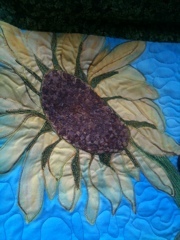 Okay, it did so when it dried , I stitched and stitched , Wow, it now looks like the sun , so that is how the rays got added . Yellow paint chalk ,and stitches, made the rays pop. Red dye to border 1 and 1 1/2 as to the yellow border . 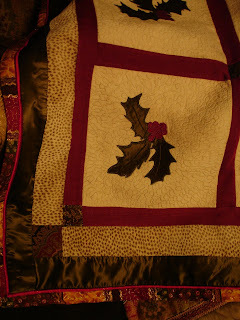 Then, I happily,stitched S stitches to look like lace. The green border 2 has Christmas mushooms( or fairy mushrooms ) Painted leaving the muslin showing for the mushroom stems. Threadpainting was added around and on the mushrooms . The green is still that same piece of muslin ,and was painted with a wash of green metalic paint, then I free handed, embroidered ferns all around. Border 3 a 3.5" red silk with self embroidery bees. 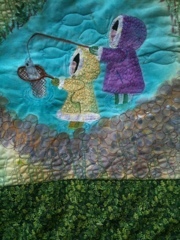 Not shown here ,the final Border 4 I used as the finished border was made of a fabulous 5" hand dyed moss green felt. Oh my, I am in love with this piece , so was Danny and Hannah. My life has been about Art and; Creativity...Heard a quote that fits "Creativity is allowing one to make mistakes...Art is knowing which ones to keep". Oh my, I never like resumes,because I was taught by wise grandparents , you are only as good @ what you are doing now. In saying that, what am I accomplishing now. Started a new business in Talkeetna Alaska in summer 2011. It is what I eat and breath. 2013 is going to be a great adventure in this new business , And I see those creations coming forward. 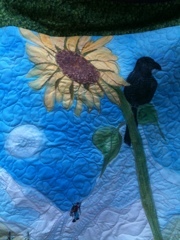 I invite you to visit, Threadsrflying's blog and enjoy taking the journey in Art and Creativity.